Ink Smith Publishing welcomes, author J. Edward Hackett to the Ink Smith family, with his debut novel The Flight of the Ravenhawk which will be available Spring 2019. Pre-orders will go live on the Ink Smith website in April. J. Edward Hackett, Ph.D. is an academic philosopher at Savannah State University who rather than engage in metaphysical speculation in process metaphysics is off building magick systems in his world of Apeiron. Fantasy fiction is itself an exploration of concepts in extreme for him. In fantasy this exploration is limited only by the imagination in much the same way that philosopher employs the intellectual imagination to solve problems that science, common sense, religion, or art cannot solve on their own. In his debut novel, Flight of the Ravenhawk, Apeiron is a world as boundless as its origin coming from Anaximander’s fragments. Wizard nobles vie for power in the Allurian Empire. Airships shoot lightning cannons. Elven archers fly atop griffins, and a dwarven kingdom is buried deep in the mountains far from elven or human spires. At the same time, Ed’s fiction cannot help but be inspired and instantiated by concepts that come from ancient, modern, and 19th and 20th philosophical systems of thought. It’s in his blood. Ed grew up scattered across the Midwest and Mid-Atlantic states. Born in Lakewood, NJ and spending most of his life north of Pittsburgh, PA, Ed has been traveling to other worlds since he bought the Star Wars D6 RPG book by West End Games and Mage: the Ascension from White Wolf as a teenager. He grew up on Magic the Gathering, 80s fantasy movies, and many comics of the 90s amidst the rust belt of Western Pennsylvania. Although a professor, Ed still goes to imaginary worlds with his friends at the age of 39. He’s in a classic AD&D game. His philosophizing meshes with the sensitivity to imaginary worlds. Just recently, he contributed an article about environmental ethics and the animated movie Wall-E in the upcoming Disney and Philosophy. He’s edited another pop culture and philosophy volume called House of Cards and Philosophy, co-edited an academic volume on phenomenology entitled Phenomenology for the 21st Century. He also published his first solo academic book called Persons and Values in Pragmatic Phenomenology (2018). When asked if she was a philosopher once, the great Simone De Beauvoir said, “No, I’m a writer.” Upon hearing that many years ago, Ed has tried to write for many audiences and emulate her example. Rachel recently graduated with her B.A. in the Arts, majoring in English with Creative Writing Emphasis and a minor in History. She grew up around literature ever since entering the hallowed halls of the library and bookstores. She has been interested in book publishing ever since her third-grade trip to a bookbinding facility. Her love for words influenced her overactive imagination to someday bring her own characters and stories to life, with hopes to be published. Reading and writing give Rachel a passionate and compassionate purpose in life. Rachel believes books provide life lessons and assistance when one suffers from harsh world realities. 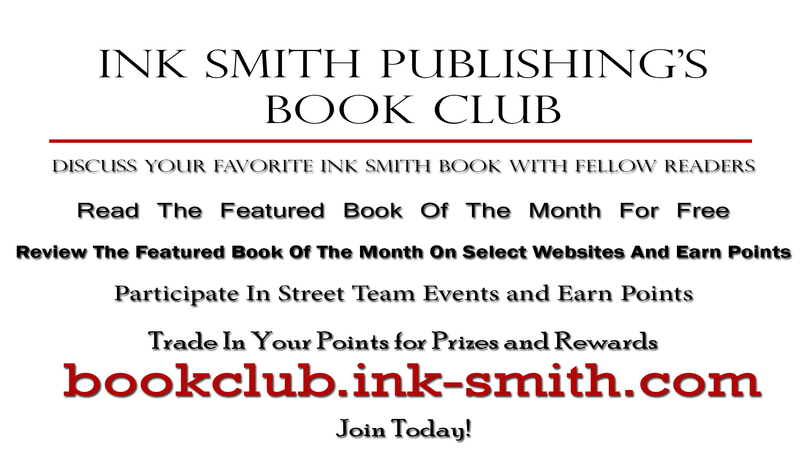 Her current project with Ink Smith is with Nicki Cusumano and her debut novel Death’s Smile! Q and A with Alec Arbogast! Inksmith Publishing would like to offer a warm welcome to our new author Alec Arbogast, author of The Last Odinian! Below are some questions he has answered for us to help get to know him better! Message from Alec: Hello! It’s nice to meet you. Thank you for reading, and let us share in our love of storytelling together. A: Even though they aren’t single stories, my favorites would be The Complete Tales and Poems of Edgar Allen Poe, and also The Great American Short Story Collection. They have both had a great impact on me. Regarding single, full-length stories, I first read The Shining by Stephen King when I was a teenager. It became a sort of catalyst for my creative mind, introducing me to the immense world of storytelling, the concept of tasteful, imaginative horror. It made me aware and reflect on the struggle between good and evil, and the grey area between the two. Q: What is your favorite food? Favorite color? A: My favorite color is blue, and I love Thai food. Q: What/whom is your favorite mythical creature? A: This is a hard answer to narrow down. Recently, I’ve been drawn to Slavic and Norse mythology. However, Medusa from Greek mythology is my overall favorite. She’s a singular, terrifying creature, who can make quick work of almost anything or anyone- even the Titans. Q: Can you share a little of any of your current work(s) with us? A: I have three writing projects I’m currently working on. One is an action-adventure novel revolving around an elite group of soldiers; one is a story that blends elements of time travel, mystery, and horror; and the other is a gangster drama set in post-Civil War America. A: I find quite a few aspects of writing challenging, but it’s always a good challenge. I’m drawn to historical fiction, and in these stories it’s a challenge to make sure I’m accurately representing the event while also molding it to fit my narrative. Pacing is another struggle as well, as I find it tends to do one of two things: the narrative flow develops naturally or can be hard to keep on track. Almost like an intractable horse, I feel like sometimes I have to nudge it in the right direction while it wanders off. Q: Did you learn anything from your book(s)? A: I learned the forbearance and discipline it takes to finish a full-length book, which can be equally an exhilarating and daunting process. I stretched myself intellectually at the same time as discovering who I was as an artist and what message I’d like to be sending. I also learned the worlds you create are a tenable space in your mind and can leave a mark on your soul. A: The Last Odinian originally came to me on a whim, to be honest. I started writing it knowing the setting and atmosphere I wanted—the haunting forests of the Pacific Northwest–and developed a narrative around that (almost similar to The Twilight Zone). Q: Do you remember how your interest in writing began? A: I’ve always been interested in the function of stories, and produced some short films in school with a few friends. I didn’t discover the writing form of stories until a few years ago. A: My style varies from story to story, actually. I try to find a voice that feels right with each individual story, and the characters within. I think my prose tends to have a grounding in the contemporary style while borrowing from romanticism and transcendentalism. Q: Who is your favorite author? What really strikes you about their work? A: I have many favorites, but I’ll try and narrow it down. On the classic side, I admire Edgar Allan Poe’s complex prose. He tackles haunting subjects, like the inescapable reality of death, in a truly singular way. Edith Wharton made me a lifetime fan based on just one of her short stories, Afterward, due to her unique style. On the contemporary side, Stephen King has influenced me with his unending creativity, and I respect his voracious need to tell stories. His characters are always vivid and three-dimensional, and he has a pragmatic approach I admire. Craig Johnson has a sort of straight-forward and laconic approach to his prose, but it’s riddled with sardonic insight. A: Find a writing process that speaks to you. Some people prefer a meticulous preparation: a diligent outline, layers of notes detailing each character, the narrative mapped out beforehand, etc. Others prefer a more organic process wherein the narrative, characters, subplot, and all the other details just flow naturally. And these are just two examples of the compositional process- everyone develops their own process. Another tip is to be true to your story. Don’t let your own moral standards and ideologies overly influence your characters or narrative. It’s important to realize the difference between who you are and what you create within your writing. On a similar note, don’t be too concerned with your audience or their opinion of you based on your writing. Write how you want and what you want, and your creations will be truer. Finally, your final story will likely be quite different from how you originally wanted it to be, and that’s okay. Evelyn Allen Harper Releases New Book: Essence! Evelyn Allen Harper just published her tenth book, Essence! This mystery novel is tinged with the paranormal and filled with surprises at every turn. You can find Essence available for purchase on the Ink Smith website, or on Amazon! We chatted with Evelyn about her current projects, what she has learned as an author, and what is behind her inspiration. Evelyn: While waiting for my current book, Essence, to be edited, I started to write a story, still with no title, in the first-person tense. I’m just sorry I hadn’t tried writing in that tense sooner. Evelyn: This is an excerpt from the untitled story I’m writing while waiting for Essence to be edited. Ink Smith: Did you learn anything from writing your books, and what was it?Evelyn: Essence is my tenth book. In every book, there were many topics I had to look up on the Internet such as the climate of the area where the story is taking place, to the symptoms of a poisonous snake bite. Facts I pick up while writing one book, I sometimes use in another book. Evelyn: I have suffered from Restless Leg Syndrome most of my life. Neither of my two sisters is afflicted with it, so one night when the syndrome wouldn’t let me sleep, I sat down at the computer and started a story that had the main character, Molly, crying over her ‘crazy legs’ that wouldn’t let her stay in bed. I emailed the story to my sisters, and when they contacted me and demanded to know “What happened next?” I continued the story for six books in the Accidental Mystery Series. Ink Smith: Is there a message in your novels that you want your readers to grasp? Evelyn: The six books in the Accidental Mystery Series are filled with facts about Restless Leg Syndrome. The Nightwalker, a publication of the Restless Leg Syndrome Foundation, gave me free advertisement for my books. I picked up readers from all over the country. The next four published books are just for reading pleasure. Evelyn: My advice is to just try to write and see what happens. You just might surprise yourself. Ink Smith: If you had to do it all over again what would you change in your latest work? Evelyn: I wouldn’t change the plot, but when I read the printed book, I always find many sentences that I would love to have the chance to change. Fun facts about Evelyn: Her favorite color is red! And she loves ethnic food. Be sure to follow Evelyn on her website: www.evelynallenharper.com! hoisting her out of the water. discovers that her best friend, Joan Wilberson, is having an affair with her husband.